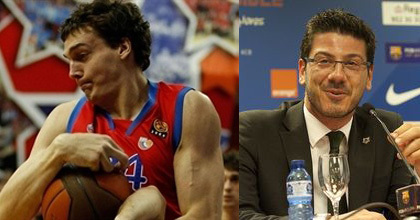 Sasha Kaun of CSKA Moscow (right) hints that he may play this summer at EuroBasket 2013 for new Russian national team coach Fotis Katsikaris. Taking The Charge Podcast Episode 26: Os Davis of BallinEurope and Dave of heinnews talk to Sasha Kaun of CSKS Moscow about the Euroleague and possibly playing this summer for Russia at EuroBasket 2013. We also talked with Bilbao Basket and Russia national team coach Fotis Katsikaris. For the music of the week, we listen to some Russia-connected music, and for the Movie of the Week we watched “The Other Dream Team” about Lithuania at the 1992 Olympics.